Lowrance 10 pin PWR/DATA connector at the device. Lowrance 5 pin network connector at the device. 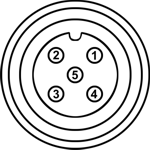 Lowrance 7 pin transducer connector at the device.